During WWII the United States government created and operated 10 Japanese internment camps, one called Topaz was located 16 miles outside of Delta, Utah. The camps were created as a xenophobic reaction to the Pearl Harbor bombing. American citizens of Japanese descent were rounded up and placed in the camps out of fear that they would attack America. After the war ended all ten of these camps were promptly demolished. None of the interned Japanese Americans were ever convicted of espionage. All that remains of the 623 buildings that once comprised Topaz is half of the recreation hall. Everything else was sold or destroyed. Today Utah teachers aren’t even required to teach the history of these Japanese internment camps. Block 8 illuminates this important piece of Utah history through the unlikely friendship between a Caucasian librarian working at Topaz named Ada (Anita Booher) and Ken a young Japanese American man interned at Topaz (Bryan Kido). The actors’ fast paced dialogue and well-placed silences moved the play along effortlessly. Early on Ken makes it clear that many of the interned Japanese were more American than anything else. He states that he and his sister only spoke baby Japanese, while his parents only spoke baby English. Before the family’s internment, guests at their parent’s hotel would joke about how American both of the children were. Ada’s use of subtle words like "Our heavenly father" and "malarkey" made it clear that Ada was a Mormon woman long before the two unlikely friends discussed their religions. The sometimes snide, but typically sincere, banter between the two characters was amusing at the right moments and thought provoking at others. Although the set design was minimal (consisting of a table and chairs and a scrim in the shape of a pagoda) the actors were able to paint vivid pictures of what life in Topaz must have been like through words alone. The two rattled off facts from government documents issued during Topaz’s life span. These facts were given life with graphic descriptions of what the facts boiled down too––unclean water, un-insulated barracks in 30 degree weather and absolute uncertainty about when the internment would end. 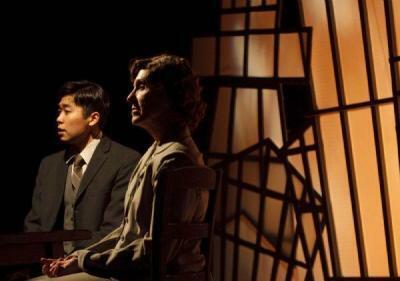 Ultimately, Block 8 brings light to what life in the internment camps might have been like. It examines the lives of two very different individuals, without trivializing or minimizing Topaz’s history. Unfortunately if you haven’t already purchased your tickets, you won’t be seeing this production. All upcoming dates for Block 8 have sold out.